Nice to start 2015 with a patient story to teach the importance of your circulation. Circulation includes structures that direct blood and fluids as they move or circulate through the body. Arteries (tubes that take the blood from the heart to the body), veins (tubes that return blood to the heart from the body), and a third part, named lymphatics, are structures that keep our bodies working. In 2008 the Surgeon General of the United States published a call to action for Venous Thromboembolism, a problem that affects veins and can affect the heart, and is a leading cause of death. Venous thromboembolism refers to blood clots (also called thrombi (plural of thrombus)) that form in a vein in the setting of slow flow, inflammation, injury, or other factors. The journal Vascular Medicine publishes patient information about vascular diseases – here is the paper on Venous Thromboembolism and Pulmonary Embolus. The patient story starts with me before I became a cardiologist or even a high school graduate. I ran on the track team in high school. My coach taught us not just track, but would also tell us he was teaching us how to stay fit and strong so that we would always know the discipline that training required — how to pace, how to stay active, how to prepare for a goal. 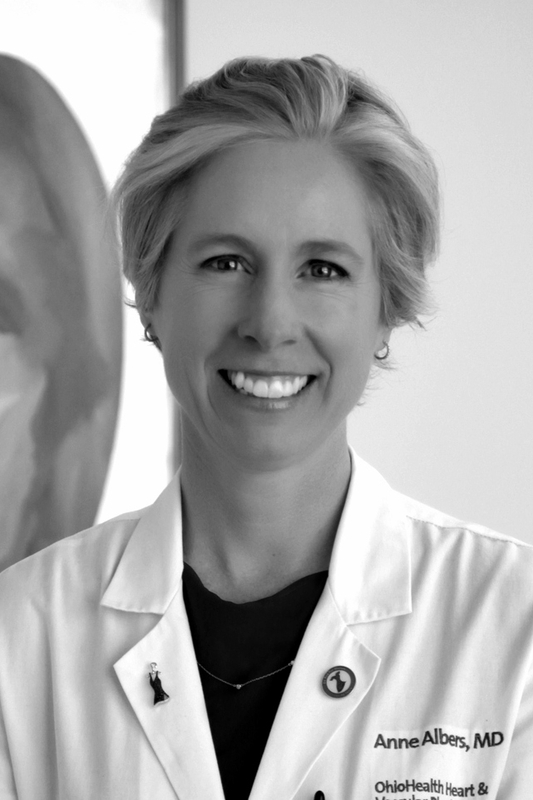 At the time I had no idea what a gift his coaching was, but went on to apply it to 10 marathons, triathlon, biathlon, rowing, my practice, and my patients because staying active plays a key role in heart health. The patient is that coach. He called me in 2013 when my focus was on training for the Philadelphia marathon. I was ready to talk about the 20 miler, how the taper might go, etc. It took a minute to realize he actually had a symptom. He has remained active and exercises at a high level with swimming, calisthenics, weight lifting, and bicycling in addition to travel abroad for work. The symptom was shortness of breath, happening when exercising or at the end of a set of pushups (yes, a set of pushups as in one of multiple reps in multiple sets). He had been getting back to his home exercise regimen after travel to Europe when the symptom started. We talked about his travel for work, how his knees were faring (he had a career as a paratrooper which had inflicted degenerative change to the knees to say the least). While in Europe he had received an injection to the left knee and was evaluated in Germany when he had subsequent significant swelling. It was when he mentioned the last bit – the leg swelling – when it clicked: chance of Pulmonary Embolus (PE). In addition to the oddity of him actually experiencing/complaining of a symptom like shortness of breath, the possibility of PE expedited his evaluation. A computed tomography (CT) scan of the chest showed bilateral PE. Followup evaluation for deep venous thrombosis (DVT) was positive for a blood clot in the leg where he had had the swelling. I have his permission to post the blood clot on the Internet so will show a still frame as well as a movie of the vein with grey DVT in the vein. 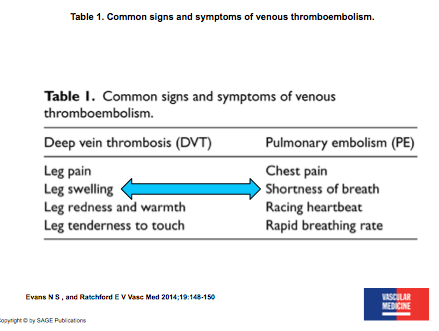 The blue arrows in the table (Table 1) point to the key symptoms he experienced, and to the shadowy grey clot as it appears on a lower extremity venous duplex (below) (the Vascular Medicine Journal patient information article by Dr.s Evans and Ratchford also has an example of a vascular ultrasound study in Figure 1, with a cross section view). Another blog post can be how to keep active people safe when an issue (like PE) happens. My partner actually showed my coach the video (below) of the blood clot floating in the vein when he broke the news that the trans-Atlantic trip scheduled for later that week as well as leg squats were on hold until treatment progressed. Another blog post can celebrate the heart healthy benefit of lifelong exercise; the patient’s echocardiogram showed normal function and heart findings of someone younger than chronological age. 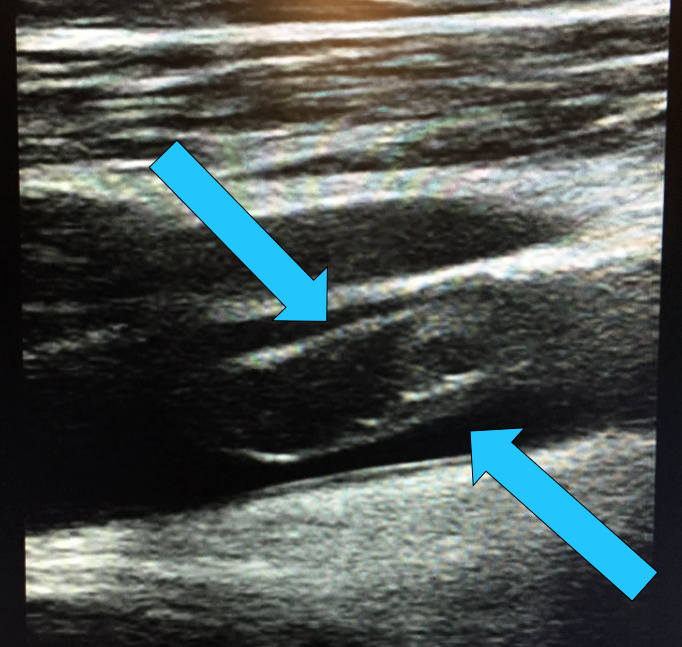 The leg ultrasound totally normalized after treatment. He did not develop post thrombotic symptoms or syndrome, which can prove challenging – as well described by Dr.s Evans and Ratchford in this Patient Information Page in Vascular Medicine Journal. For now, I am thankful for my high school track coach calling with the symptom and agreeing to share a great story & add information about blood clots, DVT, and PE for HeartHealthDocs followers interested in education about Circulation & Heart Health. This entry was posted in Uncategorized and tagged DVT, PE, symptoms on January 6, 2015 by The HeartHealth Doctors.